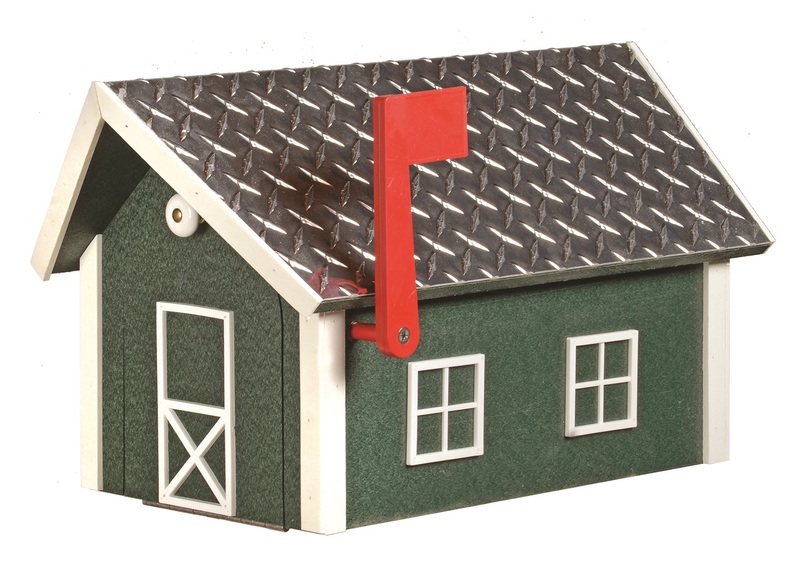 This wooden Dutch Barn City Mailbox is handcrafted with natural cedar shingles for the roof. Trim and decoration are weather resistant plastic. The floor and sides are MDO-exterior grade plywood. The size is 7" Deep x 15" L x 12" H. Meets U.S. Postal Service requirements. 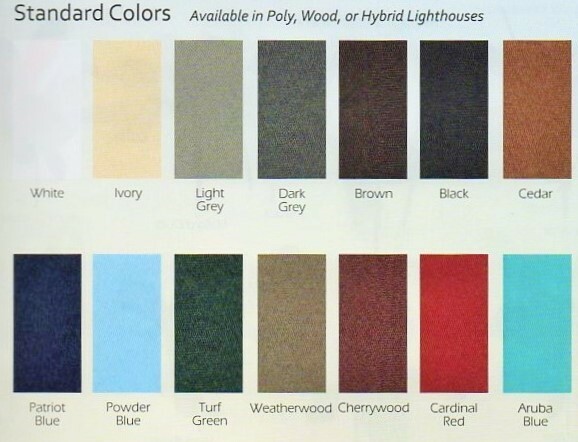 Colors available for this mailbox are: Red, Charcoal Brown, Chestnut, Cream, Forest Green, Dark Gray, Hunter Green, Wedgewood Blue, White, Almond, Cape Cod Gray, Black, Brown, Blue, Navy Blue, Beige, Light Gray, Navajo White, and Clay. Note: Specify your body color and trim color in the comment box that appears during the checkout process. The Mailbox is handcrafted with natural cedar shingles for the roof. The pine wood is torched to give it a darkened rustic patina. 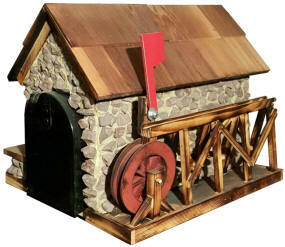 A generous amount of landscaping rocks cover the mill into which a regulation-sized mailbox is inserted. All exposed wood is sealed with a clear-coat for added protection against the weather. Meets U.S. Postal Service requirements. Wheel Colors available for this mailbox are: Red, Blue, Green and Natural. Note: Specify your wheel color in the comment box that appears during the checkout process. 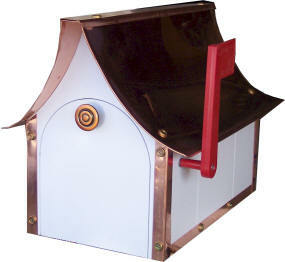 Our Estate Mailbox with Copper Roof is constructed using super long-lasting poly vinyl (Azek) and heavy gauge copper. It will not crack or peel and never needs painting. 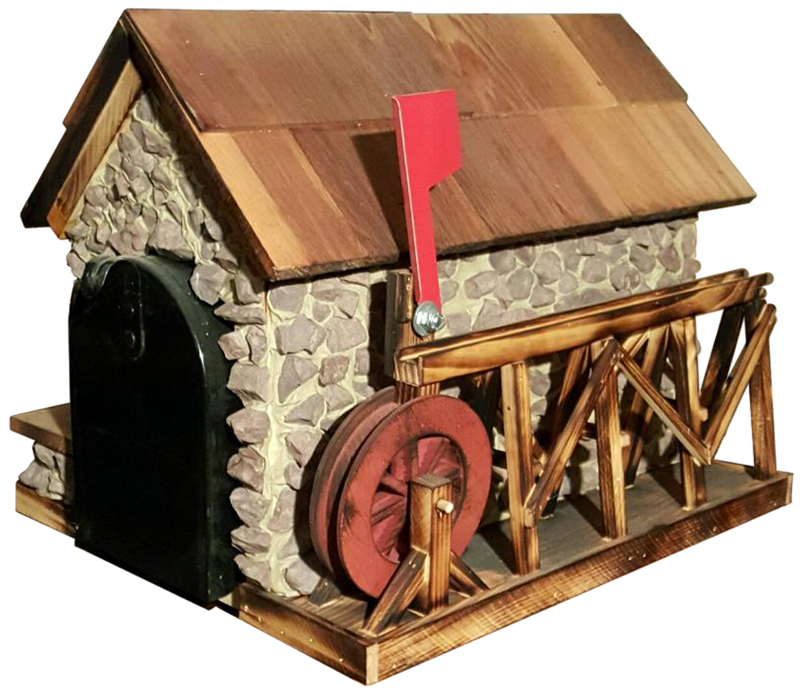 Size is 13" H x 12" W x 19" L.
The Large Barn Mailbox is handcrafted with natural cedar shingles for the roof. Trim and decoration are weather resistant plastic. The floor and sides are MDO-exterior grade plywood. The size is 12" W x 23" L x 18" H. Meets U.S. Postal Service requirements. 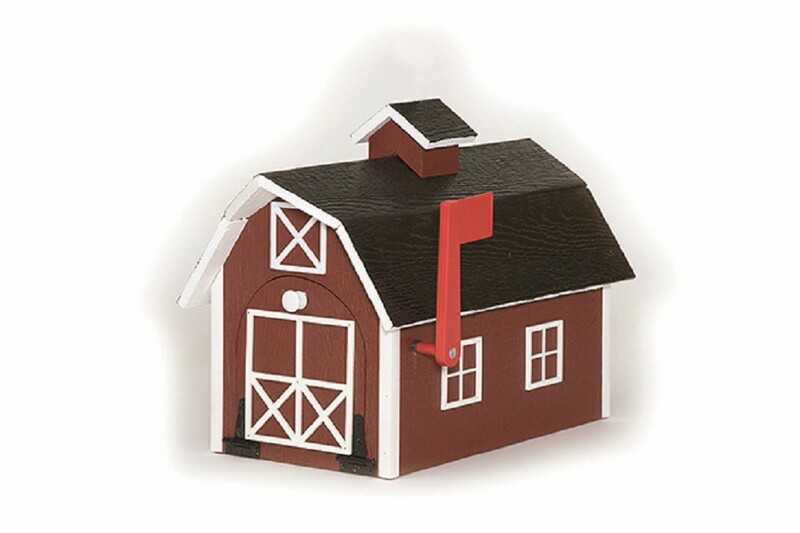 The Red Barn Mailbox look like an actual barn. 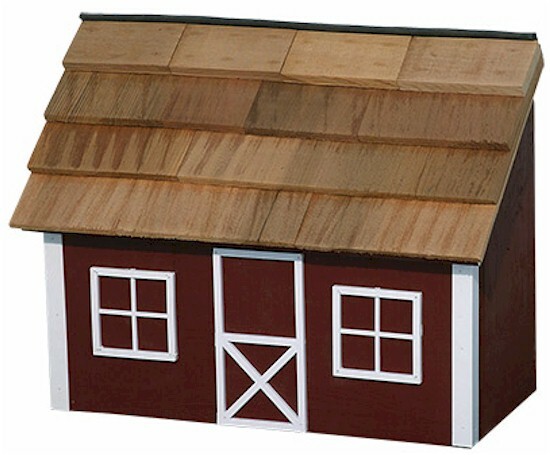 The gambrel-shaped roof has a cupola on top. The Red Barn Mailbox is made with weather-proof TI-11 plywood for the floor, roof, and sides. 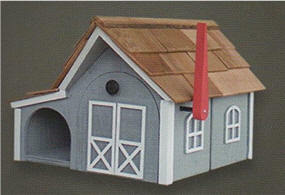 Trim and decoration are weather resistant plastic. The trim is white. 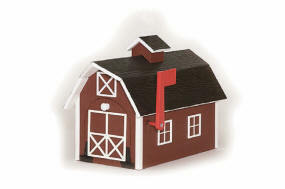 The barn is red and the roof is painted black. 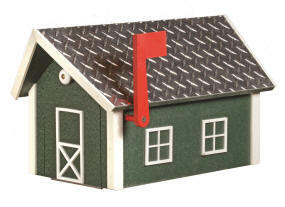 The handcrafted News Mailbox in the barn style has natural cedar shingles for the roof. To the left of the mailbox "door" is an opening for newspapers and other literature. 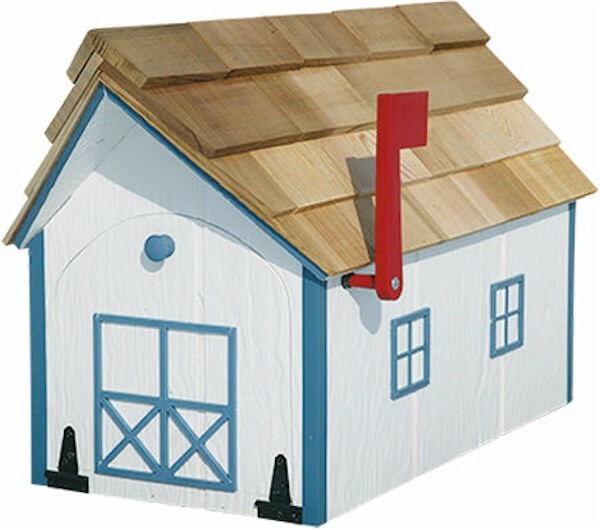 Uses weather-proof TI-11 plywood for the floor and sides.Trim and decoration are weather resistant p lastic.The size is 16"W x 20"L x 14"H. Meets U.S. Postal Service requirements. Red "flag" included. Our Deluxe Mailbox with an Aluminum Diamond Plate Roof is made with poly, a maintenance-free product, built to last a lifetime! It will not splinter, crack, or fade and needs no painting. 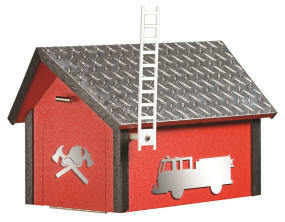 The Diamond Plate Aluminum Roof is 0.064" thick (14 gauge). Personalize Your Mailbox! Have your Station Number, Truck Number, etc. on one or both sides. Call 484-722-8259 or email for pricing. 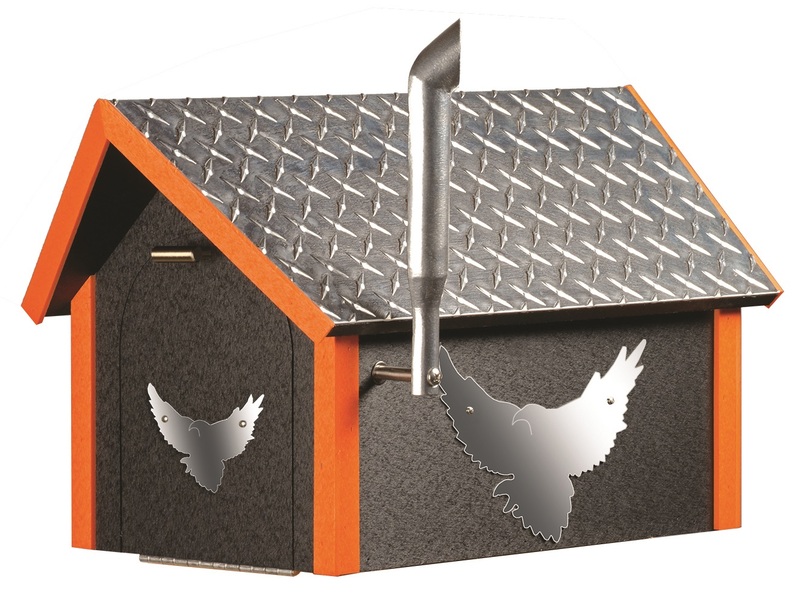 Our Deluxe Biker Mailbox with an Aluminum Diamond Plate Roof is made with poly, a maintenance-free product, built to last a lifetime! It will not splinter, crack, or fade and needs no painting. 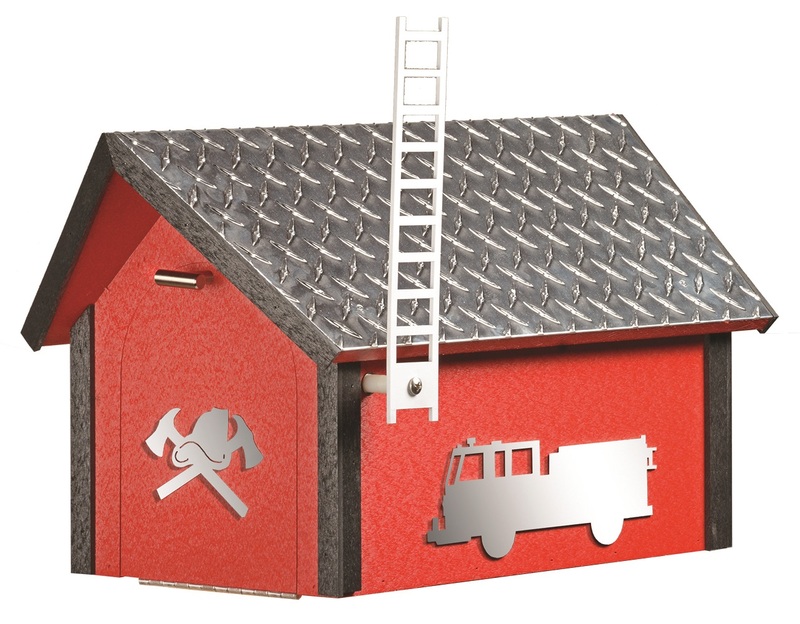 The Diamond Plate Aluminum Roof is 0.064" thick (14 gauge). Mirrored 16-gauge Stainless Steel Emblems. Exhaust Pipe is cast Aluminum.